OMAHA, NE., September 28, 2018 – Salma Hayek, Beyoncé, Jimmy Fallon, Will Smith and Bob T. Bridge, (aka Bob Kerrey Pedestrian Bridge) are all bing names celebrating birthdays this month. On Friday, September 2018, 2018, Bob is celebrating a milestone birthday by turning 10 years old – not sure how that equates to human years. "I don&apos;t feel a day over nine," says Bob, "It&apos;s easy to stay young when all you do is hang around all day by the pool...or as some people call it, the Missouri River." "While I&apos;ve enjoyed every minute with my thousands of fans, I&apos;m still looking for that special someone," added Bob, "I&apos;ve been reading the Inquirer that I may be a father down the road, so the more people I meet, the better...in other words, keep stepping all over me." 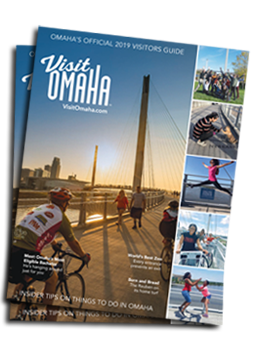 Thanks to Bob, Visit Omaha received the 2018 Bureau Innovation Award for the best marketing campaign at the Upper Midwest Convention and Visitors Bureau Fall Conference. Other accolades include Bob being named one of the 18 most eye-popping pedestrian bridges in the world and being highlighted as one of the Best Marketing Campaigns in 2017. Bob officially opened on September 28, 2008. After a little grooming, Bob got his voice in 2015 - Here&apos;s a video introduction. He&apos;s a young bridge looking for love. Currently, he&apos;s crushing on a couple of ladies in Pittsburgh (three suspension bridges the locals there call the Three Sisters). Bob is a fit bridge and encourages everyone to stay fit through his 0.9k Marathon. Bob not only works hard to ensure Nebraska and Iowa stay connected, but encourages you to stay connected too.